The Dandenong line upgrade: What’s included, what’s missing? To the surprise of many, the state government yesterday announced a major $2 billion upgrade of the Dandenong/Pakenham/Cranbourne lines — they’re saying it’ll be enough to boost capacity by about 30%. 25 new high-capacity “next-generation” trains. They’ve been talking about this for years. The newest trains on the Melbourne network are basically a 10 year-old design with some tweaks. If the talk has been correct, this new batch will have more doors (to cut dwell times at stations), fewer seats, walk-through passenger areas, no middle cabs (pointless as almost all services now run as full 6-car sets) and lots of handholds. Probably a tad longer (perhaps even a 7th carriage) — overall carrying about 20% more passengers per train. Grade separation of four crossings. They’ll hit the worst of the remaining ones: Clayton Road (where the level crossing often causes long delays to buses and ambulances), Centre Road (so close to Clayton Road you’d pretty much have to do it at the same time), Murrumbeena Road (infamous for long delays to road users) and Koornang Road. 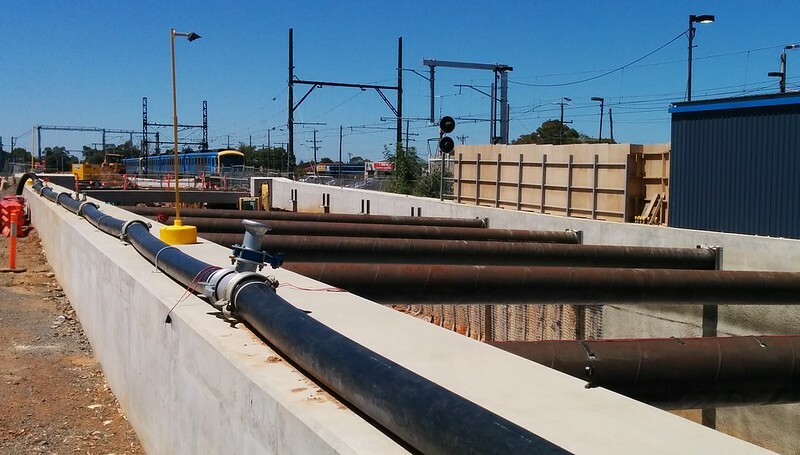 In the process there’ll be new stations at Carnegie, Murrumbeena and Clayton. Early works on more. Planning and early works funding for the grade separation of Grange Road (Carnegie), Poath Road (Hughesdale), Corrigan Road, Heatherton Road and Chandler Road (Noble Park). When these are eventually done, and given the Springvale grade separation is currently underway, the entire stretch from Caulfield to Dandenong will have no level crossings, making it possible to run a lot more trains, without causing a ruckus by blocking up road traffic — as in fact happened yesterday when following a disruption, some motorists waited up to an hour. High-capacity signalling. As I explained a few weeks ago, “moving block” signalling makes it possible to run a lot more trains along a line. Presumably this will include at least the busiest section, from the City Loop to Dandenong, but it may also include the full lines, out to Pakenham and Cranbourne. It will also need all trains running on the line to be fitted with in-cab equipment, including V/Line trains. Maintenance depot at East Pakenham. At a guess, this is where the new trains will be serviced, and I’d hope some extra track for this facility will also allow Pakenham suburban trains to shunt out of the way of V/Line trains. Power upgrades to make sure there’s enough juice for all these new trains. It appears the package is fully funded, not an election promise. It’s not clear where the money came from, but according to the government it is actually funded: The $2.5 billion for the Cranbourne-Pakenham project will be included in the Budget and is “all new money”, Dr Napthine said. The project is scheduled to start in 2015, with completion in 2019. Duplication of the Cranbourne line. I’m very surprised not to see this listed, though the rumour is that works will address at least some of it. I hope so, because the cost of it would be tiny in comparison to the rest of the package, and having a single section of track will hamper efforts to get the most capacity out of the project. Third or fourth track to Dandenong. With little CBD stabling capacity, you wouldn’t go to the expense of a third track unless you are also building a fourth. This package doesn’t appear to include this, though it’s said to be in the longer term plan for the line, particularly if the Port of Hastings is eventually developed. Hopefully the grade separations and new stations are being built with this in mind. Metro rail tunnel. This is commonly seen as a solution to rail capacity at the CBD end, but actually it doesn’t matter that much yet. Two tracks from Dandenong into the City Loop means that, provided no other trains share that loop tunnel, capacity shouldn’t be an issue. This could, of course, mean bye-bye to Frankston loop services. Enough new trains for the whole line. If you have peak services every, say, 3-4 minutes, and a round trip of about 140 minutes, you’d need about 40 trains, plus a small number of spares. Obviously there’s scope to expand the order later, but for consistent loads and running times to maximise line capacity, ideally you’d want every train to be the higher capacity model. In practice they might decide they’ll target them at the “peak of the peak” hour, or on the busiest of the two lines, until they eventually have enough bigger trains. Connecting buses. No doubt they’ll benefit from the removal of level crossings, but there’s no word on service upgrades. Getting the trunk route to the south-east working well is great, but its potential is so much greater if there is a network of frequent connecting services for the benefit of people travelling to or from locations beyond walking distance of stations — at present many connecting buses are hopelessly infrequent. Smartbus routes are a good model here, and can be provided on more routes and services boosted, particularly on weekends. It’s also unclear if quirks in the train timetables will be fixed: late Sunday starts, infrequent services early on weekends, 30 minute waits after 7pm on weekends (and after 10pm on weekdays). Hopefully these will be included in the service upgrades to accompany the infrastructure and fleet improvements. Overall it’s a great upgrade. It will bring the Dandenong line into the 21st century, with modern trains and signalling, providing a big boost to capacity… it will bring the operation of the line much closer to world’s best practice. There’s one glaring exception: the remaining single track on the Cranbourne line. Surely if you’re throwing a couple of billion dollars into the line, you’d have to fix this. Hopefully that is the case. V/Line passengers may be unhappy that they’ll still sit behind suburban trains for the metropolitan portion of their trip. That’s an annoyance, but they alone aren’t reason enough for extra tracks… V/Line’s figures indicate for the entire morning peak, the 5 trains arriving in Melbourne between 6:59am and 9:28am carry 856 passengers — about one suburban train load. Certainly something needs to be done to improve travel times for regional passengers (and attract more of them off the road), but the immediate concern is suburban capacity. And the new signalling and measures to reduce suburban train dwell time delays will help. It does make sense to target one line with a package of upgrades to ensure its performance will be humming as demand continues to grow. But it begs the question of when other lines and other public transport users around Melbourne will benefit from this kind of modernisation. As a Murrumbeena/Hughesdale station resident and train user this can’t come soon enough. Not only for the increased train capacity for morning peak but for the reduction in traffic congestion in my own street. I have often sat at a red light at poath road for 25-30 mins when having to drive to work on occasion and this can be on a “normal” morning without any incident. No line duplication from Caul-Dand is a worry though, why can’t they squeeze that in too? Is there space? Overall a great upgrade and desperately needed. I wonder if the maintenance depot being built a Pakenham East will mean that the plan for Baxter has been dropped. This is the most abhorrent and disgusting “announcement” I have come across in my time. It will ensure I never, ever vote for Napthine for as long as I live. This “upgrade” will render my job virtually redundant, I am disgusted that my taxes are finding this farce, a farce that will eventually see me out of a job. This will completely and utterly f**k over any V/Line Traralgon uses – though as you say above, who cares (ok, you didn’t say that in so many words, but that was the basic idea. Melbourne matter, country don’t.) You say the immediate concern is suburban capacity? I say f**k suburban capacity. The south east already has a fantastic service, it hardly needs to be any better. More people would use V/line if there weren’t 1-2 hour gaps, completely insufficient parking at most stations, and obscene travel times. Since any potential funding for these much needed improvements was blown yesterday in this announcement, nothing is going to change anytime soon for V/line. Not for the better anyway.. Please, explain to me why we need to spend $2b for high capacity trains and signalling to appease the 9-5ers? Trains are busy for about 4 out of the 24hours in a day. The peak, 7-9 & 4-6. Generally speaking, unless a train has been cancelled, outside those times, everyone has a seat, enough room to swing a cat. 6 car normal capacity trains with signalling that has worked for how many hundreds of years seems to work pretty fine for 96% of the time. Please explain why we need to be running high capacity trains all day every day when there’s not enough people to fill a standard 3 car Comeng through most of the day. You mention that having permanently coupled 6 carriage trains is a good thing, not necessarily. Currently, I’m led to believe if there is a fault, 3 car units can be remarshalled so that the train can stay in service with the affected carriages being in the centre instead of being driven from. Not so with permanent couples 6 carriage trains. Say goodbye to the whole train until its fixed. This will be exacerbated by having 25 trains that will be stuck permanent on the one corridor. Also, please explain why V/Line & freight operators should have to modify their fleets (Locomotives, sorinters, vlocities) to appease someone from Nobel Park who demands a train every 30 seconds? Neither of these operators will get a single benefit out of this absolute schamozzle. These operators will also have to have a line specific fleet or modify their entire fleet. I can tell you now, when I start experiencing cancellations due to defective trains and train shortages, I will be blaming YOU and the PTUA morons who have campaigned for this sham. Now, Pakenham East? Wasn’t there a Growling Grass frog or -a specific lizard type that was supposed to be hampering development of the particular area this was meant to be built on. I’m interested to know what they have done and are planning to do with this frogs habitat. Once we damage an animals habitat there is no getting it back. But it would not surprise me in the least if they have been tearing it up (lots of earthworks there in recent times) destroying its livelihood enough that they can say its buggered off. Appalling behaviour, but it wouldn’t surprise me. Someone from Beaconsfield might not want to wait more than a minute for a train so better get high capacity trains and high capacity signalling. Yeah. Please explain why Regional Victorians don’t matter. Regional Victorians already get a substandard service (it takes 2 hours 20 minutes to get from Traralgon – Melbourne by train, 1 hour 40 minutes by car…) and now you think they deserve to be sitting behind a 3-5 minute frequency service all the way from Pakenham to Melbourne? Are you kidding me? The ONLY solution to assist Melbournians AND regional Victorians from gippsland has always been a third or forth track to Dandenong. This will never happen now, and it’s because of people like you campaigning for useless high capacity signalling. Please explain to me how high capacity signalling will allow a Vline train to overtake a metro train? You can’t? Then how can ANYONE (including the government) claim that this is in any way a benefit for V/Line users? Oh, and please explain how “new signalling and measures to reduce suburban dwell time” will in any way assist a V/line train sandwiched between 2 3 minute frequency metro trains. I have only recently started catching the trains to and from huntingdale after moving house, previously I caught the Belgrave/Lilydale lines from Mitcham. I welcome any further upgrades to these lines. I’m sure there is enough physical space to run a 3rd track/line at least between Oakleigh and Caulfield for express trains and Vlines to allow them to run faster, It would makes sense to have the 3rd line run all the way to Dandenong similar in the way the express trains to Belgrave go all the way to Box Hill before stopping which makes the travel really quick (* Except for the horrible ride at Camberwell :) ). For me personally for convenience sake I wish the pakenham trains in peak hour stopped at Huntingdale on the way out instead of having to wait around 8mins at Oakleigh to change to a cranbourne/westall/dandenong train, its the only stop past Oakleigh that they skip. More parking at train stations would also increase patronage. Try and find a carpark at any almost any station after 8am is a near impossibility. wash road and wheel lathe and transfer sidings. after a turnaround., though i have not seen anything concrete on this. possible third platform like sydenham is also an option. I don’t think Denis Napthine will deliver this. He just cares about the useless East West Link. On the other hand I don’t think Labor will deliver this either. Con raises some good points. At what stage do we need to say no to things like this because it is to the detriment of others. 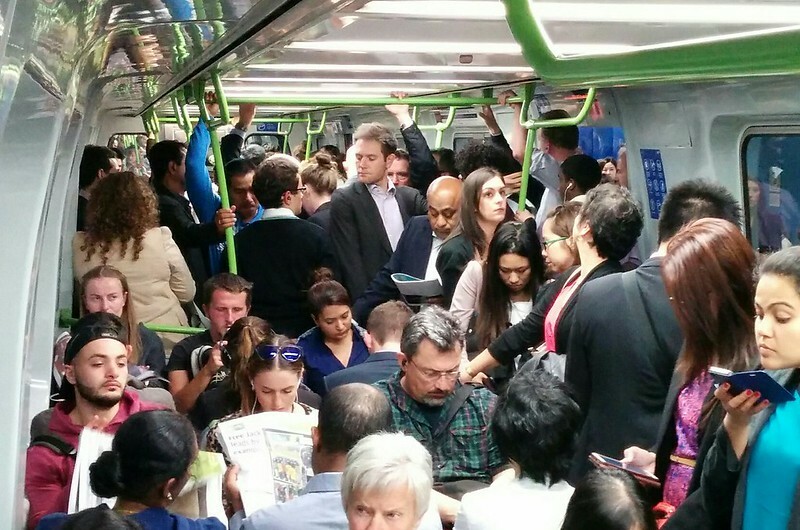 What happens to the people who moved to regional Victorian commuting boundaries and now will find their journey will take longer? Additionally, they are encouraging regional cities to grow and whilst there will be more local jobs, it also means more potential commuters to the city. You can’t wipe the entire regional population off and just say suburbia is a priority. A bit more on V/Line compared to Metro… From the PTV Station Patronage Research figures, weekday AM peak station entries for Carnegie to Pakenham/Cranbourne was 22,722. This is probably not a precise comparison, because some of those people will travelling against the peak direction – let’s say 5%, meaning 21,585 in the peak direction on Metro, about 25 times the 856 on V/Line. Sorry, but I’m not seeing why the 4% should take priority over the 96%. As I said, longer term yes they should look at more tracks (and yes, higher V/Line frequencies). But in the mean time, reducing the delays for suburban trains helps the V/Line trains too. @Trainz, thanks for the further detail – very interesting! Very foolish man if you think 856 people (and growing) are insignificant because they don’t get a regular & frequent train service like those on the pakenham & Cranbourne lines already do. You absolutely cannot do a fair comparison unless you run Vline at Metro frequency and then compare. Any comparison on them at their current state clearly doesn’t count because its heavily weighed in metros favour. More regional commuters would use the service if it was as frequent at the metro is. This “upgrade” will ensure little scope for extra Vline services due to no capacity and as such people will no doubt leave the service. I can see this as a bigger picture for wanting to terminate vlines at pakenham. Despicable. Speaking to someone high up a few months ago, said they hope to do the whole Caulfield to Oakliegh section in one go, and include four tracks. Two of which would both be dual gauged and be for V/Line and Dandy/Port link freight trains. I wonder if Natphine has simply forgotten to state that in his press release. CON, I see a lot of what you are saying. They should stick to grade separation and putting in the two express tracks too. The capacity enhancement of the two required express tracks should outweigh anything you can obtain by so called high capacity signals. The existing design in signaling should permit a two minute frequency. I say, stay with old faitful, and build more tracks. Grade separations should be done by putting the tracks overhead. Not under. Solely for cost. For the same cost of going under, we should be able to do the whole line by going over. @Andrew, I’ve long been of the view that when you descend to personal abuse, you’ve lost the argument. I can see a need to run V/Line trains *at least* every half-hour (all the way into the city)… I’m less convinced they should run every 9 minutes as Pakenham trains run now in peak. Even if they did, I’d suggest the demand is not going to be as high as from the suburban stations. @TranzitJim, yes extra tracks provide more capacity than moving block signalling…but are much much more expensive. Sounds like in the south east they are working towards METRO’s 2017 Peak Service Plan which includes cross routing Frankston trains to the West rather than taking them round the Loop. Now Another issue with the Pakenham line is that the annoying Cranbourne line is there too, sometimes there are as many Cranbourne Trains as there are Pakenham which doesn’t make sense. What they do currently is after 8 or 9 there are no more Cranbourne trains and they run as a shuttle to and cram Cranbourne/Dandenong. They should use this method all the time, except during the peak and shoulder peak periods with will allow them to have more trains on the Pakenham line. Narre Warren station should be rebuilt or they should make another road to access it, currently if you look at Google maps there is only ONE road to get to and from the station, Webb street. Now in the weekend its fine but in the morning and afternoon peak it is Chaos and there is traffic coming from every square inch, they should remove the level crossing at Webb street because it’s horrendous. Now I havent forgotten about you V/Line people. What they did at westall was make 3 tracks for a few Km’s. Now if they extend that 3 tracks from Westall to Clayton, Huntingdale or oakleigh then even though it doesnt go all the way to Dandenong there will still be lots of room for trains to pass. Unfortunatly it looks like the Springvale Level crossing removal doesnt have room for 3 tracks but after springvale it could EASILY be 3 tracks to Dandenong without any major works. This means it can be 3 or even 4 tracks from Oakleigh to Dandenong with 2 at springvale. This is my Opinion, let me know what you think, don’t get abusive from what I say, I’m open to different peoples views. Also let me know what you link Daniel, you seem like a very interesting guy who likes PT as do I. Looks like a good start with more to be done. BTW, did you see the report with Australia’s most family friendly suburbs? Most are outer suburbs with little PT. Size of block and price of land was main determinant of family friendly. nothing on where trains will be manufactured. If like the recent Qld order then they will be Bombardier (based in Dandenong) all built in India. We have lots of rail rolling stock mfg capability – it would be great for Vic got to insist on minimum 50% local content for builds. Good point, Hopefully their made In Dandenong by Bombardier, local jobs is good plus it wont have to be on a boat for months, they roll out of the factory and Bobs your uncle, their there on the Cranbourne line! It will be interesting to see whether they rationalise the wasteful road layout at Murrumbeena, knock down that tired row of single-storey shops on the south side of Neerim Rd. east of Murrumbeena Rd., move the railway car park from prime sites to a decked area over the tracks, and put in some decent 4-5 storey apartments with streetfront shops. It’s the kind of thing we were told MTR is used to doing in Hong Kong, though on a different scale. I have no confidence a government department has been savvy enough to land bank there, but it’s the kind of thing I would expect a savvy developer to already have in the bag before taking their “unsolicited proposal” to the government. P.S. I’m not by any means advocating wholesale demolition – that would be killing the patient to save him. For example, there is a terrace of late deco shops in Neerim Rd. farther along that should be kept. Running all of the trains all-stops along most of the line is not a good idea. It makes the trip too slow. If you can’t provide extra tracks, you can’t have a “two-tier” service. And, with frequent trains, trying to run “all-stops” trains interspersed with limited-stops expresses doesn’t work. The possible solution is to run alternate trains stopping at every second stop. This would cut travel time by a worthwhile ten minutes and boost national productivity. @Aidan is right – a third and/or fourth track is probably possible along much of the existing reserve fairly easily, and might be able to be done fairly cheaply. @Roger, the idea of “family friendly” is very subjective. They appear to have taken the view that open space is better, but ignored the implications for older kids living in outer suburbs, with difficulty in accessing jobs and education. @Philby, the Premier did make some comments about local content in the trains in media coverage. @enno, track expansion is inevitable, but is not included right now. Skip-stop might work, though it can be a tad confusing for people. Surely you know that your metro to V/Line comparison is very unfair, even nonsensical. V/Line has a far smaller number of people (your numbers aren’t way off the truth) in part because of the smaller population but also due the far inferior service. 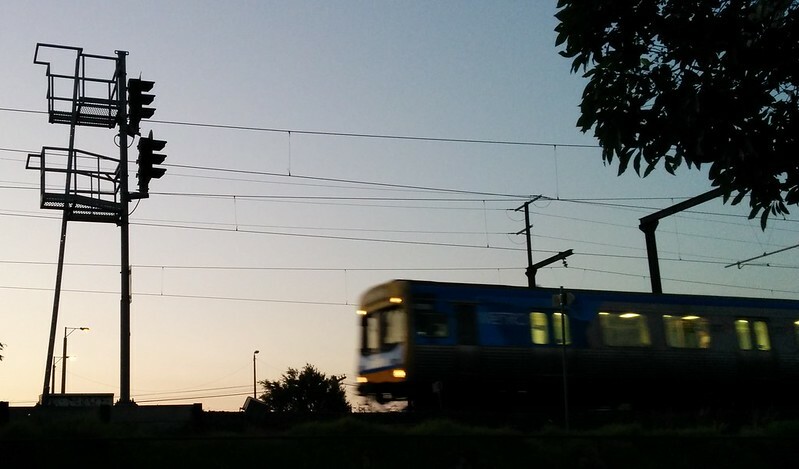 There are only five services that arrive from Latrobe Valley into Melbourne before 9am. How can this be compared to the very high frequency metro customers have. Then you have to consider that capacity on each service is very limited also, a maximum of 3 Velocity carriages on its services. Compare that to Geelong that has seven on its flagships. I’d never pretend that the numbers would be equal, but I don’t think that any V/Line customer is asking for parity in terms of preferential treatment, merely a “fair go”. Finally, consider that the Regional Growth Strategies have ear-marked significant growth in regional urban centres over the next 30 years – Warragul, Traralgon, Moe etc in the East – and for these communities and economies to thrive it is essential that they have appropriate transport links to Melbourne. Decisions for the future shouldn’t be made on what is currently being observed as it is far from a level playing field. The rail upgrade is long overdue and as one who lives beside the line I give it some attention, I think that regardless of all the wishful thinking being done it is the geography of the route which will will dictate the actual outcome for this line. Consider this (with approximate figures) Caulfield has an elevation of 50 metres, Carnegie 46, Murrumbeena 40, Hughesdale 50 and Oakleigh 56 metres. The practical, traditional and economic railway approach would be to elevate the line so that it passes over Murrumbeena Road. To attempt any other way would waste taxpayers money. @John – wow I can’t believe it’s only a 10 meter drop (or climb) between Murrumbeena and Hughesdale – standing at Hughesdale and looking down the line, it looks much more. @Doug – I have taken the figures from the Vic Map Topographic maps T 7922-3-3-1 and -4 and I have no way of contradicting their authority. Looking down last weekend at the new Springvale station you can see that there is NO provision for any extra tracks – so much for express lines or the proposed freight link to Westernport! And Metro’s solution to capacity improvement is to build 9 carriage trains in the future. Can you imagine how far from the driver the passengers in the last carriage will be? The vandals will have a field day, not to mention the distance the passengers will have to walk along the platforms! @CliffL, my understanding is the provision for tracks 3-4 will be reserved land on the south side of the new tracks (eg where the existing tracks are). It might get used as car parking, but not built upon. Neither will it get dug out until a future track expansion project is funded. “V/Line passengers may be unhappy that they’ll still sit behind suburban trains for the metropolitan portion of their trip. That’s an annoyance, but they alone aren’t reason enough for extra tracks… V/Line’s figures indicate for the entire morning peak, the 5 trains arriving in Melbourne between 6:59am and 9:28am carry 856 passengers — about one suburban train load”. This comparison that you’ve drawn isn’t a “FAIR GO” to V/Line passengers. As has been mentioned, the sheer frequency of the service (something the PTUA regularly cites as a premium importance for PT) isn’t remotely comparable. Incidentally, those five services have just over 900 seats. So 900 seats have been supplied, and around 900 people are sitting on them. I know, there are more standees in metro areas but this is because the journey is shorter. 2) Secondly, a fair go in timetable planning. The PTV bends over backwards to give metro all the slots it wants and expects V/Line to fit in around it. Hence, customers on this line and other regional lines have seen journey times increase, service times becoming more more inconvenient and delays becoming worse. Phil R too is quite right because he agrees with me and a good example is the Flinders street via duct. The third option would be a series of bridges to carry the road over the tracks a la Burnley Street Burnley, Warrigal Road Oakleigh, South Road Moorabbin, Somerton Road Roxburgh Park etc, The flaw in this solution is the large footprint which denies ground space to any other use. Hi guys my name is Stormy Gleed, and I’m a reporter from The Age. I’m actually looking for a person who would like to be interviewed that lives and takes the Dandenong rail line. I would like their comments on it, and also comment on this particular issue that Daniel has written about. They would also need to be available on May 6, when the budget is relased to give their comment on what the budget is doing/not doing. Please feel free to contact me at [email protected] or [email protected]. I will provide my contact details if you would like to be part of it. Only serious applicants apply, and only people that are living in the Dandenong area and take trains from Dandenong Station. And Daniel, I’d like to thankyou for this piece you have written. I am surprised people here are calling for the railway line to be elevated above the street level at Murrumbeena and neighbouring level crossings/stations. It would be an example of ugly infrastructure – a concrete monstrosity dumped right in the middle of local shopping areas, creating an unsightly structure that will physically divide the community. Going underground, like they did at Springvale, is the way to go, to create an uncluttered, open area around the local shopping centres which surround these stations. I have read with interest the arguments by both metro rail users and that of V/line customers. Well as a individual who was raised in Gippsland and lived approximately the first half of my life there (and have family who still live up there) and now live in the area affected by this rail corridor (for most of the other half of my life) I believe I offer a unique and mostly unbiased opinion. The arguments of raising the rail line above the ground are out of touch with modern thinking and sustainable practice. It’s akin to building the old Berlin Wall through areas and splitting community’s into two. The arguments about giving priority to metro trains vs regional trains also falls on deaf ears from my point of view also. As my home is located in the wedge between the packenham/cranbourne lines and also the frankston lines, as the Melbourne metro sprawl and relocation to regional Victoria has increased so have the number of trains on both of these railway corridors. As a resident who unfortunately has found that the luxury of using Public Transports does not get me to where I need to go I am forced mostly to drive. What started out as being a maximum of a 15 min wait between boom gates going down and then coming back up has now grown at times to be over 30 minutes. I have often sat in a vehicle and counted how many trains go past before the boom gates come up again to let any traffic past and regularly count 8-10. At times I’ve counted 15. Often when the boom gates do go up only a handful of vehicles get through before having to wait for more trains to pass. Sure if you take each suburb as an individual the number of individual people affected by not being able to cross rail tracks at specific level crossings will be negligible to those who travel through from outer suburbs or regional areas, but does it make it right that these individuals should be put to a greater inconvenience just because more people now want to live further out on larger blocks of land? No, we all make choices in lifestyle about where we choose to live and work and no individual group should have their needs improved in isolation to the needs of others. Having the rail dropped down at least at strategic points along the corridor initially frees up some routes that allow local residents to cross the rails and ease congestion on the road network and public transport links such as busses to rail connection points. At the same time improves safety frequency of rail services, reducing the chance of collision between various transportation methods. Having also travelled and lived overseas in Japan,Europe (& UK) and the USA. I find arguments about needing entire lengths of track duplicated to allow for express services to be an expensive and unwarranted option. Most of the the destinations I mentioned have issues with the availability of land being highly competitive with other uses, so mostly within urban areas regional and suburban trains share the same network. In the past Melbourne had a network that was designed with this efficiency in place with sections of corridors where an extra line was in place allowing express trains to overtake stationary ones as they stopped for passengers. We have simply outgrown our current system due to increased traffic volume and population along these corridors. For those who have taken a look at the the proposed Melbourne rail link will note that the big picture is not simply to improve one corridor over another. It is designed to try take out the bottle necks inherit in the system by having multiple lines sharing the same tracks. For exams the Packenham/Cranbourne line will not simply enter the loop and return back out but will link through to Sunbury and the new Airport link. The Frankston line will be re routed to no longer go through Richmond but rather link to the new Domain & Fishermans Bend station before linking to Belgrave. Essentially Melbourne will have only 6 rail lines on separate tracks. A break down or incident on one line will no longer have flow on effects that stop trains and services along other lines running to efficiency. Sure there may be short comings of what has been proposed by the current government. They are however making an effort to solve a problem with a rail network that has had no major fixes in approx 30-40 years since we had the opening of the city loop. In fact if you look at the history of Melbourne rail we’ve gone backwards from when our system was designed. Many metro lines that once existed in the past that where closed down, land sold off and redeveloped in fact could have been a solution to much of Melbourne’s congestion problems. Historically many of these lines linked the major lines we still have today, if still in place they would have allowed many people who commute by road to be able to efficiently move between lines without the need to travel first into then out of the city that now makes the use of trains impractical for many. So instead of arguing amongst yourself over who should get priority over the lines, try to take a step back, don’t be selfish and look at how’s can I get the best solution for me. Take a bigger step back and say well what’s going to be the best option for the community now and into the future. Base your logic on economic, environmental, demographics now and into the future. No option will serve to suit 100% of the people 100% of the time but with a little understanding about the big picture and not individual self serving needs as most of the arguments on this thread are. Overall the current plans are good. They solve many problems for those living in inner, outer and regional areas. They may not be perfect however without having the full picture about land that may have been set aside along the corridor for future expansion they go a long way to improving the system. Rationalization of about 13/14 lines, depending on how you count lines like Cranbourne/Packenham (ie 1 or 2) that share tracks with 2 major bottle necks entering into the CBD down to 6 individual lines that run independently from other lines and problem that occur has to be an improvement to the system over all. Mate, those of you who are complaining about waiting half an hour for a suburban train, or an hour for a vline train (you know who you are). Get over it. You have to wait one hour for a train, on no how terrible. The town I live in has only one return train every day, and a bus that doesn’t even run every day Monday to friday, and many towns nearby are even worse off than my town! If only you lot could see how silly the complaining and carrying on sounds.